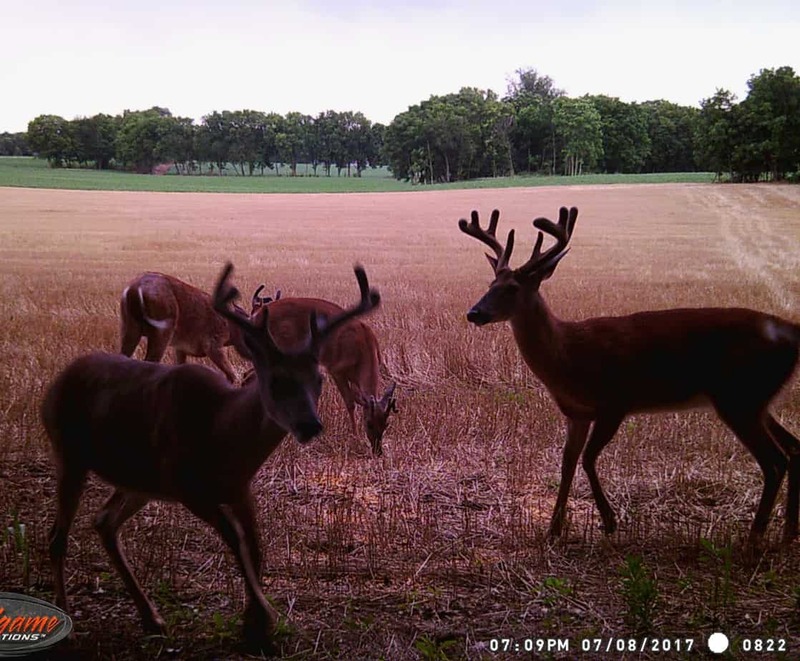 Summer Whitetail Fun: 10,000 Trail-Cam Pictures, 30 Bucks! I have been swapping emails with one of our bloggers who has a very unique situation going on with his local whitetail herd. So unusual that even super deer biologist Grant Woods is impressed. I got more than 5,000 pictures in the month of June alone and most of them were bucks. This leads me to believe that our property is the summer home for the majority of the bucks in the area. 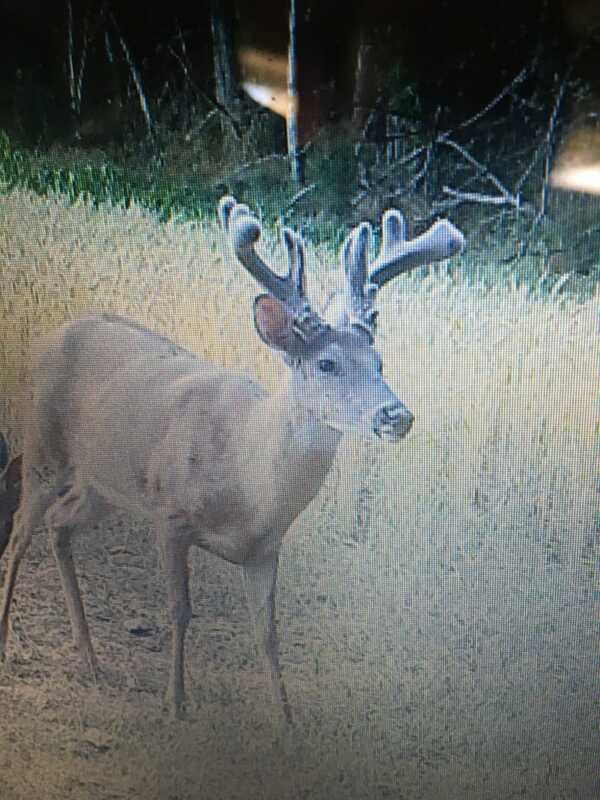 There are easily over 30 different bucks that I am getting pictures of every day. I only have 2 cameras up, and they are only 250 yards apart. I checked them again recently, and one camera had another 1,066 pictures and the other camera had 3,227 pictures since July 1. I clarify that all of the bucks aren’t in one big group. They are typically in groups of 3-6 bucks. But there are just so many small bachelor groups. I know it’s normal for bucks to form bachelor groups in the summer, but is it normal for this many bucks to stick together in a 30-acre spot? The property is larger, but they stay in this 30-acre area all summer, every summer. This all sounds normal, except for the number of bucks. Is there a habitat feature in or near the 30 acres that’s unique for the area? Maybe a water source, reason bugs aren’t as bad in this area, less disturbance from two or four-legged predators compared to other areas? There’s some reason the bucks are spending a lot of time in this area. Bucks almost always disperse about the time they shed velvet. During past years have you noticed most of these bucks using a different portion of their range? Do the dominant bucks continue using this area? If so, that’s a great sign that there’s a limited resource there that bucks need year round like a natural mineral lick, etc. It just dawned on me a possible reason for so many more bucks this year. It might not be that much of a phenomena and more that they were pushed to find a new home. There is a place about 1 mile away from our property where they recently bulldozed all of the woods, put up a tall fence and have been blasting away on the construction site. I bet that is what has pushed more deer onto our land this summer. They lost their bedding area. By the way, I think the number one reason that bucks congregate here in the 30 acres every summer is that they are protected. It is basically a sanctuary. They have thick cover, plenty of food and there is a stream. Our property butts against a place that doesn’t allow hunting or trespassing. And that property butts against the interstate so there is no access at all from that side. If you were to look at a topo map you would see several hundred acres of farm fields and then a 30-40 acre patch of thick woods that butts up to the interstate. This is their summer sanctuary. The only humans they might see the entire summer are either the farmers or me checking my cameras. That would be the only thing about our property that is different from the surrounding area. The bucks are undisturbed. And, yes, Mr. Woods is correct. Every year around mid-September, once the velvet comes off, the bucks disperse. And, no, the dominant bucks never stick around. We are generally always left with a handful of smaller bucks. But maybe with the change in habitat, one the bigger bucks will stay on our land this fall, I hope so. 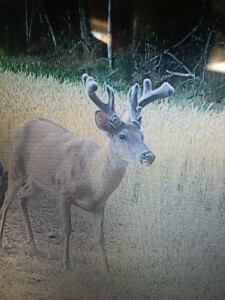 Finally, our blogger asks: This is one of the bigger bucks I have on camera. Do you think those brows are going to split? I hope so. Yes, I see a big split brow (both sides! ), hope he hangs around your spot in September bow season. Good luck. This entry was posted in Big Bucks, BigDeer, Bowhunting, Deer Hunting, Deer Science, Hanback, whitetail deer by admin. Bookmark the permalink.